One of our readers wrote to tell us .....On January 23 2013, the coldest day of the year -25 this morning. At 4:00 pm I was brushing snow off my truck and a Bald Eagle flew over head. This was at Wasaga Beach, Ontario. Randy from Kirkfield told us ..... My wife and I were travelling along highway 48 on Sunday morning January 27, 2013 in Kirkfield, Ontario, when we spotted a Bald Eagle sitting in a tree. Scott says ..... On February 1st at dusk I witnessed 2 Bald Eagles circling above the Maitland River just east of Goderich. They circled for 5 to 7 minutes and then flew upriver towards the Benmiller area. It was awesome to watch. Nice to see them in the wild. Jeff from St Thomas wrote to say ..... We are at Springwater Conservation Area in Orwell, Ontario, and sat and watched a Bald Eagle circling around in the sky. I was amazed at this sight as I have only seen them in photos. 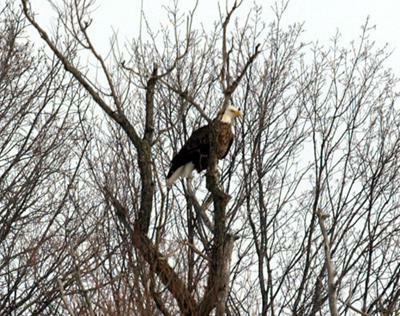 One of our readers, says he saw Bald Eagles.... Not once, but twice in the last two days I saw a Bald Eagle flying along the south side of the 401 near a small river just west of Tilbury, Ontario. I'm positive it was one, as I live in Dorchester, Ontario, and there is a family of Bald Eagles living at the Boy Scout camp east of town. I'm across the street from the Thames River and they patrol the river. An absolutely amazing creature to watch. Thank you all for telling us about your sightings of these magnificent birds. It certainly is wonderful to know that their numbers have recovered, and they are living and breeding in our area!